Romantic movie quotes can do wonders for giving your love relationship a wealth of romantic inspiration. Find useful short funny quotes in funny movie quotes and include them in your love emails. For me, the top movie quotes are the ones filled with creative romantic words of love. Finding cool romantic movie quotes is one of my favorite reasons for watching romantic movies. Harry: "I love that you get cold when it is 71 degrees out. I love that it takes you an hour and a half to order a sandwich. I love that you get a little crinkle in your nose when you're looking at me like I'm nuts. I love that after I spend day with you, I can still smell your perfume on my clothes. And I love that you are the last person I want to talk to before I go to sleep at night. And it's not because I'm lonely, and it's not because it's New Year's Eve. I came here tonight because when you realize you want to spend the rest of your life with somebody, you want the rest of your life to start as soon as possible." Lucy: "It's just... I never met anyone I could laugh with. You know?" Lucy: "Do you believe in love at first sight? Nah, I betcha don't, you're probably too sensible for that. Or have you ever, like, seen somebody? And you knew that, if only that person *really* knew you, they would, well, they would of course dump the perfect model that they were with, and realize that YOU were the one that they wanted to, just, grow old with. Have you ever fallen in love with someone you haven't even talked to? Have you ever been so alone you spend the night confusing a man in a coma?" Peter: "I'm making a clean start with Lucy. She is - She is - She... What is she? She's..."
Jack: "I'd say that she gets under your skin as soon as you meet her. She drives you so nuts you don't know whether to hug her or, or just really arm wrestle her. She would go all the way to Europe just to get a stamp in her passport. I don't know if that amounts to insanity, or just being really, really... likable." Peter: "No, that's not it." Peter: "But she's gotta be really special. She's gotta be. And I can spend the rest of my life finding out why." Jack: [Lucy's sitting in the booth at the station taking tokens for the train. Suddenly someone drops a ring, making her look up] "Lucy? I have to ask you a question." Elsie: "Get down on one knee, it's more romantic." Saul: "Elsie, if he's proposing let him do it!" Elsie: "I am letting him do it." Jack: "Can I come in there please?" Lucy: "I can't. Not without a token." Jack: [he hands one in and goes into the booth] "Marry me." Lucy: "Yeah. I love you." Jack: "I love you back." Tin Woodsman: "What have you learned, Dorothy?" Dorothy: "Well, I - I think that it - it wasn't enough to just want to see Uncle Henry and Auntie Em - and it's that - if I ever go looking for my heart's desire again, I won't look any further than my own back yard. Because if it isn't there, I never really lost it to begin with! Is that right?" Dorothy: "We must be over the rainbow!" Dorothy: "Somewhere Over The Rainbow, Bluebirds fly. Birds fly Over The Rainbow. Why then, oh why can't I? If happy little bluebirds fly beyond the rainbow, why oh why cant I?" The Wizard of Oz: "Hearts will never be practical, until they are made unbreakable." High Aldwin: "Magic is the bloodstream of the universe. Forget all you know, or think you know. All that you require is your intuition." Madmartigan: "Did I really... Did I really say those things, last night, in your tent?" Sorsha: "You said you loved me." Madmartigan: "I don't remember that." Sorsha: "You lied to me." Madmartigan: "No, I... I just wasn't myself last night." Sorsha: "I suppose my power enchanted you and you were helpless against it." Sorsha: "Went away? "I dwell in darkness without you" and it went away?" Hubbell Gardner: "When you love someone, from Roosevelt to me, you go deaf, dumb and blind." Katie Morosky Gardner: "I don't have the right style for you do I?" Hubbell Gardner: "No you don't have the right style." Katie Morosky Gardner: "I'll change." Hubbell Gardner: "No, don't change. You're your own girl, you have your own style." Katie Morosky Gardner: "But then I won't have you. Why can't I have you?" Hubbell Gardner: "Because you push too hard, every damn minute. There's no time to ever relax and enjoy living. Every thing's too serious to be so serious." Katie Morosky Gardner: "If I push too hard it's because I want things to be better, I want us to be better, I want you to be better. Sure I make waves, you have, I mean you have to. And I'll keep making them till you're everything you should be and will be. You'll never find anyone as good for you as I am, to believe in you as much as I do or to love you as much." Hubbell Gardner: "I know that." Katie Morosky Gardner: "Well then why?" Hubbell Gardner: "Do you think if I come back it's going to be okay by magic? What's going to change? What's going to be different? We'll both be wrong, we'll both lose." Katie Morosky Gardner: "Couldn't we both win?" Katie Morosky Gardner: "Wouldn't it be lovely if we were old? We'd have survived all this. Everything thing would be easy and uncomplicated; the way it was when we were young." Nick Marshall: "I can see elegant parties..."
Darcy McGuire: "You can see all that?" Nick Marshall: "Well, maybe you're naked and I'm the only guest, but it's still elegant." Darcy McGuire: "What kind of knight in shining armor would I be if the man I love needs rescuing and I just let him walk out my door?" Michael Green: "My wife is an alcoholic. Best person I ever met. She has 600 different smiles. They can light up your life. They can make you laugh out loud, just like that. They can even make you cry, just like that. That's just with her smiles. You'd have to see her with her kids. You'd have to see how they look at her, when she's not looking. To think of all the things she lives through, and I couldn't help her." Alice Green: "Maybe helping wasn't your job." Michael Green: "Well, it wasn't. See I love her. And I tried everything, except really listening, really listening, and that's how I left her alone. I was so ashamed of that, and I couldn't even tell her. Maybe if I tell her she'd love me anyway." Alice Green: "It's horrifying how much you can hate yourself for being low and weak and he couldn't save me from that. So I turned it on him; I tried to empty it onto him. But there was always more, you know. When he tried to help I told him that he made me feel small and worthless. But nobody makes us feel that, we do that for ourselves. I shut him out because I knew if he ever really saw who I was inside, that he wouldn't love me. And we're separated now, he's moved away, and it was so hard not to beg him to stay. And I don't know if I'm going to get a second chance but I have to believe. That I deserve one. Because we all do." "All our young lives we search for someone to love, someone to make us complete. We choose partners and change partners. We dance to a song of heartbreak and hope, all the while wondering if somewhere, somehow, someone perfect is searching for us." "I know I never done the right thing, I never said the right thing, and I act like a fool. I always say that we'll be just buddy-buddy friends, but I will not be true to my heart. So I ask you this one question. And if your answer is no, I will leave you alone once and for all. Be my wife Mary. And I'll take care of you, be true to you, and like this house I built for your dolls, I will provide a strong roof over your head. If your answer is yes, then no one will ever love you as much as I love you. If your answer is yes, you will make me the happiest man on the earth." ".....I think I'd miss you even if we'd never met." "The hardest part of love isn't loving someone, but having the courage to let them love you back." "The hardest thing is loving someone and having the courage to let them love you back." This romantic movie quote has been around for quite a long time and it is still FABULOUS, don't you agree? "Only you, you're the only thing I'll see forever. In my eyes, in my words and in everything I do." "Goodnight, goodnight, sleep well and when you dream, dream of me..."
"Maria. I just met a girl named Maria, and suddenly that name will never be the same to me. Maria. I just kissed a girl named Maria, and suddenly I've found how wonderful a sound can be. Maria. Say it loud and there's music playing. Say it soft and it's almost like praying. Maria. I'll never stop saying Maria." "I have a love and it's all that I have. Right or wrong, what can I do? I love him, I'm his and everything he is...I am, too. I love him, we're one. There's nothing to be done. Not a thing I can do but hold him, hold him forever. Be with him now, tomorrow, and all my life..."
"Soul mates. It's extremely rare, but it exists. It's sort of like twin souls tuned into each other." Here is one of the more powerful romantic movie quotes! "If he loved you with all the power of his soul for a whole lifetime, he couldn't love you as much as I do in a single day." "I make you my queen. Whatever happens out there, here, you will always be my queen." "Make the world stop right here. Make everything stop and stand still and never move again. Make the moors never change, and you and I never change." "I want to crawl to her feet, whimper to be forgiven, for loving her, for needing her more than my own life, for belonging to her more than my own soul." "...he's more myself than I am. Whatever our souls are made of, his and mine are the same." "...if everything in the world died and Heathcliff remained, life would still be full for me." "How can you stand here beside me and pretend not to remember? Not to know that my heart is breaking for you, that your face is the wonderful light burning in all this darkness." "If you ever looked at me once with what I know is in you, I would be your slave." "Be with me always. Take any form, drive me mad, only do not leave me in this dark alone where I cannot find you." "I cannot live without my life! I cannot die without my soul!" John Beckwith: "Claire! Will you wait just a second? All I wanted is was a second alone with you so I could explain things. But I've never gotten that chance. Maybe I don't deserve it, so here goes. For longer than I care to remember, my business has been crashing weddings. I crashed weddings to meet girls. Business was good. I met a *lot* of girls. It was childish and it was juvenile." John Beckwith: "Yeah. That's probably the best word to describe it. But you know what? It also led me to you, so it's hard for me to completely regret it. And that person that you met back at your folks' place? That was really me. Maybe not my name, I'm John Beckwith by the way. Or my job. But the feelings we felt; the jokes, the stupid laughs, that was all me. I've changed. I've realized something. I crashed a funeral today." Jeremy Grey: [mutters] "Oh Jesus." John Beckwith: "It wasn't my idea, I was basically dragged to it." John Beckwith: "I went with Chaz who you forgot to tell me is totally insane. He also might be a genius because it actually does work, he's cleaning up." John Beckwith: "I'm sorry, I'm sorry. That's neither here nor there. Anyway, I saw this widow and she's a wreck. She has just lost the person she loved the most in this world and I realized we're all going to lose the people we love. That's the way it is, but not me. Not right now. Because the person *I* love the most is standing right here and I'm not ready to lose you yet. Claire, I'm not standing here asking you to marry me, I'm just asking you not to marry *him* and maybe take a walk, take a chance." Jeremy Grey: "I'm not perfect, but who are we kidding, neither are you." Jeremy Grey: "Gloria, I've been doing a lot of soul searching recently, and I think I'm ready to take this relationship, our relationship to the next level." Gloria Cleary: "Jeremy, I am so ready to take it to the next level." Gloria Cleary: "Yeah. Do you want to watch me with another girl? How about those Brazilian twins we met at the ball game?" Jeremy Grey: "I was thinking more along the lines of an engagement." Gloria Cleary: "Oh Jeremy, I do!" Jeremy Grey: "I love you." Gloria Cleary: "I love you." Claire Cleary: "What is true love?" John Beckwith: "True love is your soul's recognition of its counterpoint in another." Claire Cleary: "It's a little cheesy but I like it." John Beckwith: "I read it on a bumper sticker!" I hope you are having lots of fun browsing through our romantic movie quotes! There are so many ways to use and enjoy them. You can make a game with the really well known romantic movie quotes. Find a small collection (like 3) of your very favorite romantic movie quotes. Make sure that your partner is reasonably familiar with the romantic movie quotes you have chosen. Write out the quotes on index cards putting ONLY one or two words on each card. Mix up all the words of your romantic movie quotes. Let your mate figure out what the original romantic movie quotes were. This game can be quite hilarious! 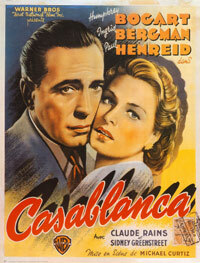 Discover Romantic Movie Posters and Romantic Art Prints from Romantic Movies! Yum!